Lawmakers in the European Union (EU) often lament the lack of citizen engagement with the complex policy questions that they wrestle with in Strasbourg and Brussels, so we assume that they will be delighted to learn that more than 4,000,000 of their constituents have signed a petition opposing Article 13 of the new Copyright in the Single Market Directive. They oppose it for two main reasons: because it will inevitably lead to the creation of algorithmic copyright filters that only US Big Tech companies can afford (making the field less competitive and thus harder for working artists to negotiate better deals in) and because these filters will censor enormous quantities of legitimate material, thanks to inevitable algorithmic errors and abuse. Currently, the Directive is in the "trilogue" phase, where European national governments and the EU negotiate its final form behind closed doors. We're told that the final language may emerge as soon as this week, with the intention of rushing a vote before Christmas, despite the absolute shambles that the negotiations have made of the text. On Monday, a delegation from the signatories officially presented the Trilogue negotiators with the names of 4,000,000+ Europeans who oppose Article 13. These 4,000,000 are in esteemed company: Article 13 is also opposed by the “father of the Internet”, Vint Cerf, and the creator of the Web, Tim Berners-Lee and more than 70 of the Internet's top technical experts, not to mention Europe's largest sports leagues and film studios. Burgeoning movements opposing the measure have sprung up in Italy and Poland. With so much opposition, it’s time for negotiators to recognize there's no hope of salvaging Article 13. Much of the new Copyright Directive is a largely inoffensive slate of much-needed technical tweaks to European copyright, which has not had a major revision since 2001. At this point, the entire Directive is in danger of going down in flames to salvage an unworkable, absurd, universally-loathed proposal. 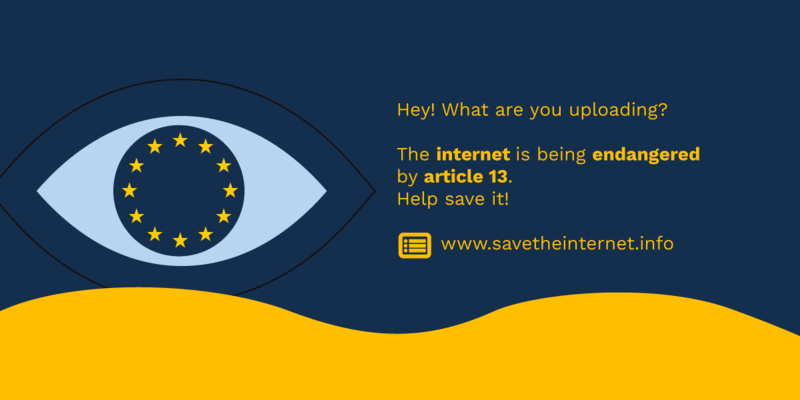 Let's hope that the Trilogue negotiators understand that and take steps to save the Directive (and Europe, and the Internet) from this terrible proposal.